I love this. Very cool tree. Congrats on your sale. Beautiful artwork, love the movement! Wonderful, Laura! I love the way you've given the blue glow an effect of movement! Wonderful, Laura. Congratulations on your sale. Fabulous image, Laura . . . congrats on the sale. 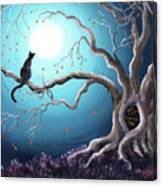 What a fabulous image Laura...loooove those little eyes inside the tree!! v/f! Very, very nice! Congrats on your sale! Thank you, Chris :-). 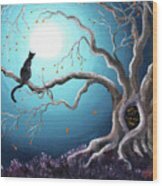 That was one I did on commission a few years ago. 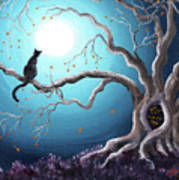 A black cat sits on ghostly tree branches, gazing at the full moon. The night sky is in shades of teal, blue and indigo. A few of the autumn leaves are dancing in the air. 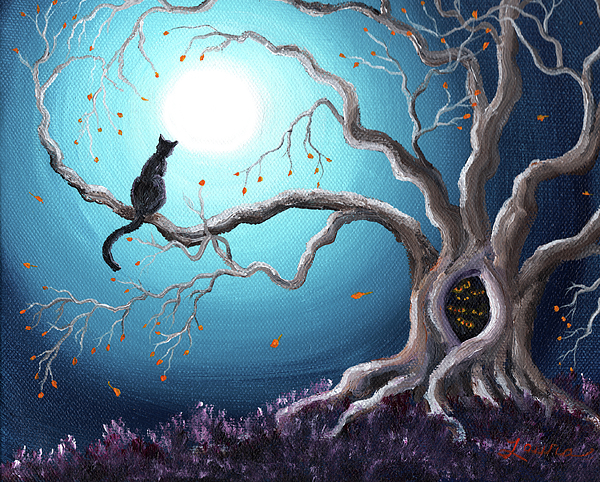 In the hollow of the tree, bright eyes peer out. 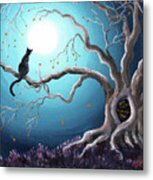 This Halloween fantasy landscape is sold but prints are available.